You know those teen movies from the late 90's and early 2000's, that took place in prep schools or country clubs, and they always had this ominous feeling hanging over them. You feel like something bad is happening, or is about to happen, and it's always just on the edge of everything. That's what this book was like for me. The whole time I was reading, I felt like I was watching one of those movies. And bravo, to Paige Harbison, for being able to consistently convey that feeling throughout the whole story. I like that we don't get a name for the main character until the very end. 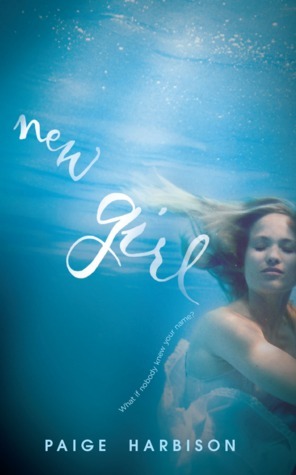 In the beginning people actually call her new girl, but as the story goes on, she's just never refered to by name. It was an interesting choice by the author, but it added to the mystery of the whole thing. When we first meet her everything is tinged with a sense of dread, because she does not want to be at Manderly. Her homesickness is only made worse when she finds out the girl who's room she now lives in, is missing, and people don't really seem to want her as the replacement. The characters in this story were pretty intense, for so many different reasons. Dana, her roommate, was best friends with the missing girl and is on the verge of complete crazy. Max is very closed off, secretive, and hot and cold with his feelings. Johnny is the kind of overly nice, trying to care for everyone kind of guy. Sometimes it's a good thing, but sometimes it's creepy in it's own way. We get alternating viewpoints from "new girl" and Becca, the missing girl. It was definitely nice to be able to really read the differences in personality between our main character, and the girl everyone is comparing her to. Becca seeks out trouble and pushes people into liking her, while "new girl" just wants to fit in and doesn't understand why people can't see that she is worth knowing. I originally thought this book was going to be the type of mystery, where the mc is desperately searching for clues and trying to solve what happened to the missing girl, but it didn't end up being like that at all. And it's better for it. It was definitely mysterious, because no one really knows what has happened and there is the added element of gloom all around. It's really just a story about people trying to move on, or not, with their lives now that someone important is gone.